Nothing comforts a dog in stressful situations quite like the gentle hug of a Thundershirt! Dog anxiety is a surprisingly common problem and includes issues like fear of thunder, fireworks, separation, travel, crating, problem barking and much more. Millions of dogs in the United States suffer from anxiety severe enough that their owners are seeking help. And these anxieties are often very serious problems for their owners… destroyed furniture, damaged homes, personal injury, lost sleep, loss of control, financial strain. These problems frequently cost owners thousands of dollars in veterinarian, trainer, and damaged property bills. Medication is the most common approach used to treat anxiety… unfortunately, drugs are expensive, time consuming, risk negative side effects, and often result in very limited improvement. But there is another solution that is highly effective for most dogs. The history of Thundershirt is truly a story of a common problem in need of a simple solution. Thundershirt is committing to relieving fear and anxiety in all dogs. In partnership with Petfinder.com and the Petfinder.com Foundation, we have sent thousands of Thundershirts to shelters and rescue groups across the country. If you’d like to help a dog in need, donate a Thundershirt to your local shelter or rescue group. Just go to shelter.thundershirt.com to make a donation to a participating organization. If you don’t see your shelter or rescue group in the drop down list, call us and we’ll add it to our donation program. Thundershirt uses gentle "hugging" to calm your dog or cat. 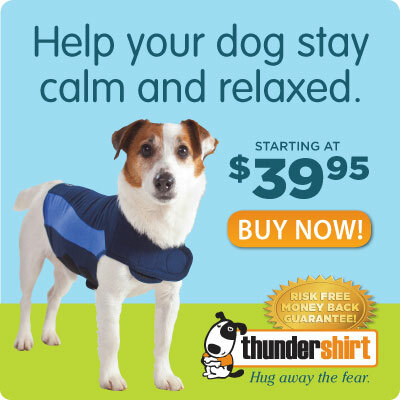 With its patented design, Thundershirt’s gentle, constant pressure has a dramatic calming effect for most dogs and cats if they are anxious, fearful or overexcited. Based on surveys completed by over two thousand customers, over 80% of dogs and cats show significant improvement in symptoms when using Thundershirt. Thundershirt is already helping hundreds of thousands of dogs and cats around the world and is recommended by thousands of veterinarians and trainers. Thundershirt’s patent-pending design is a pressure wrap that applies a gentle, constant pressure on a dog’s torso. From real world experience, we know with certainty that Thundershirt DOES WORK. That is why we are able to offer a money-back guarantee. A survey of Thundershirt users shows that over 80% of dogs show significant improvement in at least one anxiety symptom when using Thundershirt. Why Doesn't My Bet Know About This Remedy For Anxiety and Fear Issues? Good question! With millions of dogs suffering from anxiety, it amazes us that such an easy to use, inexpensive solution like Thundershirt isn’t more widely known and used. Thundershirt is working to change that; we have launched an outreach campaign for veterinarians. If you would like us to speak with your veterinarian, please just give us a call and we are happy to talk to your vet! For many types of anxiety… none! Just put Thundershirt onto your dog and you will likely see results with the very first usage. However, for some dogs, it may take two to three usages to see results. For some more serious anxiety cases, such as severe separation anxiety, you should consult a good trainer for how to integrate Thundershirt into a training program. Thundershirt is designed to be safe to leave on your dog for extended periods of time when appropriate for the situation or issue that you are addressing. Thundershirt is made out of light-weight, breathable fabric, so over-heating is very rarely an issue. When properly sized and properly put on with a comfortably snug fit, your dog should be very comfortable for extended periods. It is typically safe to leave a dog unsupervised while wearing a Thundershirt. If you will be allowing your dog to wear a Thundershirt for extended periods (e.g. over 2 hours), during the initial periods, we do recommend removing the Thundershirt frequently to check for any signs of irritation points. Irritation points are very rare, but best to be cautious. What Do Verterinarians Say About Thundershirt? I have used Thundershirt with my own dog and have seen a real improvement with her fear of thunderstorms and other loud noises. I am now recommending Thundershirt to my clients with good results. Staying calm during stressful situations like storms, travel, new situations, or even coping with separation anxiety is so important for your dog. Thundershirt provides a gentle 'hugging' sensation that helps your dog to feel more secure, relaxed and unafraid. You can often find Thundershirt at Petco, Walmart, Bed Bath and Beyond, Amazon and many local and online retailers! If you had further questions or needed help with an order, please don't hesitate to call us!